Standing on a hill overlooking the lands of the Kirsvald is an ancient mansion, the seat of power of the Staufen family. After years of decline and creeping corruption, the once noble house has become a den of wickedness and the center of a twisted plot orchestrated by an ancient evil. Now the locals fear the Staufen name and hate the oppression that has become their lot. It is into this deadly nest that a group of brave heroes must descend to uncover and defeat the vile serpents that poison this land. A complete adventure for four or more characters of 1st through 3rd level. A detailed gazetteer of the region including an extensive map. Fantastic maps of the mansion. Variant scenarios for incorporating mass combat rules from the Advanced Player's Manual. New mechanics like the Damned feat and the Sinthrall template. New stat-block formats for easier play. Terrifying creatures drawn from The Book of Fiends like the cranial wretch and the herlekin. Mansion of Shadows launches Green Ronin's Bleeding Edge Adventures. Designed with today's savvy gamers in mind, this adventure blends thrilling combats and exciting play environments, with the juicy roleplaying opportunities that keep bringing us back to the table. Whether you use it as a stand-alone adventure or as part of a new campaign, Mansion of Shadows takes your game to the Bleeding Edge. We're proud to present a collection of sinister foes for GMs to incorporate into their Bleeding Edge games. Each villain includes a short history, advice for using the character with a Bleeding Edge adventure, and a stat-block. Each one is perfect for expanding play in any Bleeding Edge Adventure. 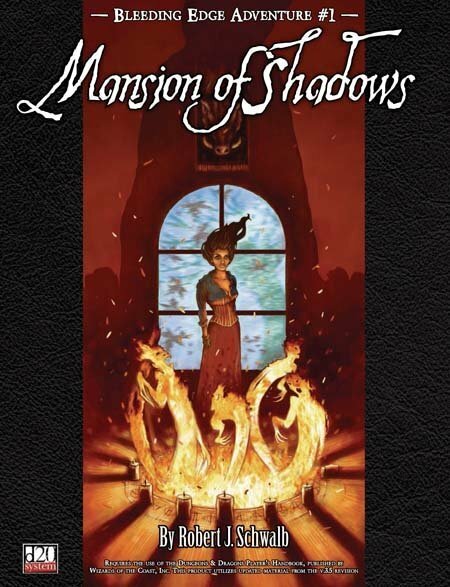 This PDF Web Enhancement details how to adapt Mansion of Shadows into the True20 System.